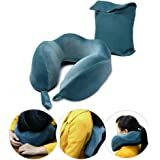 ✈️【Soft and U Shape】The packable neck pillow is made from excellent quality memory foam. It’s softer and more comfortable than inflatable pillows.It’s designed to adapt to your neck, and lets you sleep comfortably in different positions. You can also adjust the size by adjusting the piston to find the most comfotable position. 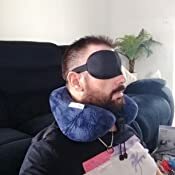 ✈️【Free Travel Accessories】The travel pillow kit includes an eye mask, a set of earplugs and a convenient carrying bag. You’ll fall asleep in no time! ✈️【Portable & Lightweight】It has a portable design with a storage bag making it easy to carry during travel. Save your luggage space by folding to a smaller size (15 x 14 x 14cm ). ✈️【Multifunctional】 It’s not just for traveling either. 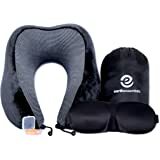 You’ll love using neck pillow while catching up on your favorite shows at home and during those long days at the office. Roll it up and store it away in the included carry bag for whenever needed! 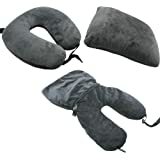 ✈️【Removable and Washable Cover】 This travel pillow is packed with high-quality soft velour. The removable and washable cover makes cleaning and eliminating germs easily. ✈ Let you Enjoy Your Flight, Vacation Time And Business Trips! 🔸 Are your neck and shoulder sore after flying from sleeping in awkward positions and cramped seats? 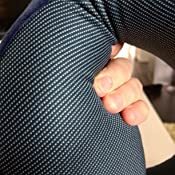 🔸 Don’t Look Any Further – This is the travel pillow you’ve been searching all over for! 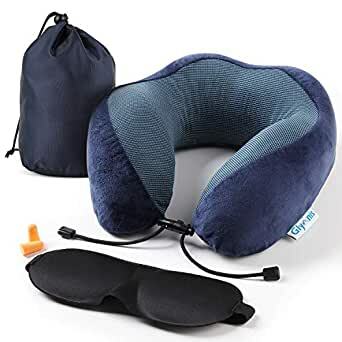 🔸 This travel neck pillow kit will help make your flight a bit more relaxing and help you nod off and catch up on some much-needed rest. 🎀 Why You Choose Us? 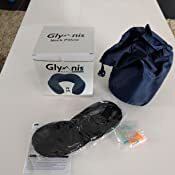 The pillow is lightweight (360g) and can be easily rolled up and packed in the included carry bag to a smaller size (15 x 14 x 14cm ). The cover of it is made from velvet which can be took off and washed. It makes cleaning and eliminating germs easily. 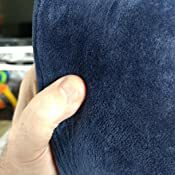 🔹 Do not wash the memory foam pillow core. 🔹 Do not expose it to the direct sunlight or high temperature( Over 104℉/ 40℃). 🔹 Pillow cases can be machine washed at temperatures below 140 ℉/60℃ (or quick clean with mild soap). It also can be dried by washing machine. 5.0 out of 5 starsWill be great for our holiday this year - will buy another one! Bought this to see if it's any better than the ones you can get from Kmart or Target, and the answer is a big YES. This cushion is far superior and really worth the money. It feels exquisite the materials are excellent, and the rubber is very supportive. I'm gonna buy another one for our trip later in the year. The eye pad and ear plugs are a nice touch to complete the set. 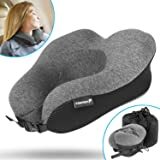 5.0 out of 5 starsComfortable neck pillow..!! Very comfortable neck pillow. 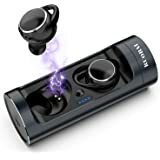 I am using this while reading books, watching tv and it’s awesome..! !